John T and Bruce tackled more boot scrapers (as there was nothing to do on the loco). John needle-gunned and wire-brushed six chairs; Bruce applied top coat to eight that were already in the production line, and then slapped black on John's six bottoms. Gil, aided by Jeff L [Loco Dept], removed most of the mud-hole doors and boiler wash-out plugs. 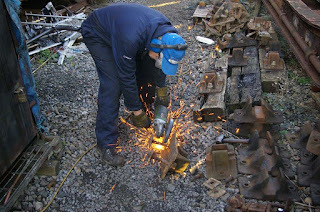 John P & Martin C [both Loco Dept] removed the fire bars from the grate. 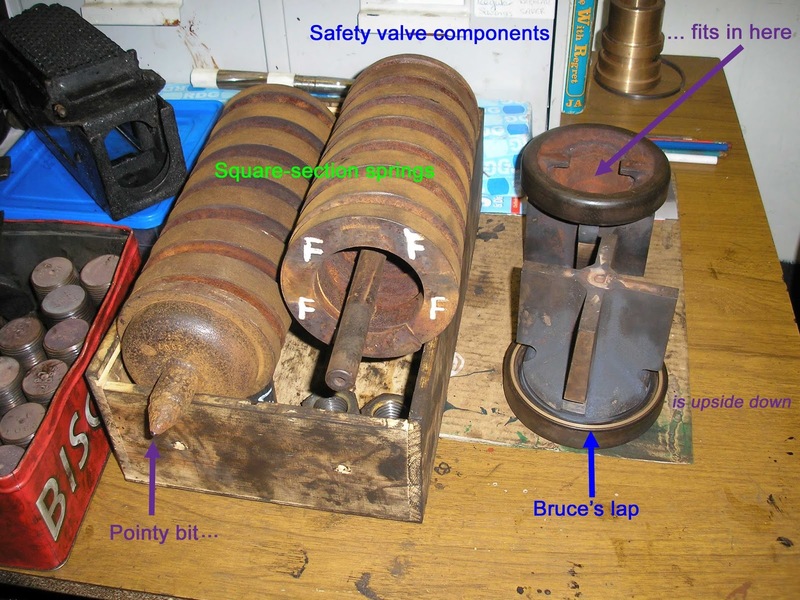 Bruce stripped and lapped the safety valves. All of this was in preparation for a boiler inspection next Monday. During the morning, I needle-gunned and wire-brushed three rail chairs that were boot scrapers back in for refurbishment. After lunch, I was giving Martin a lesson in lighting-up. It was a bit tricky, as most locos had had their grates removed, and some locos kept moving about! What we decided in the end was that next Wednesday 2807 will need a warming fire lighting in readiness for a steam test on the Thursday … Martin can do that! After the lesson, I returned to the TPO to black the bottoms of the three that I had prepared, plus pick out the gold lettering on six that Bruce had top-coated. John T cleaned the wash-out plugs and the mud-hole doors. Then he applied primer/undercoat to 7 rail chairs. Finally, towards the end of the day, when the last few plugs were out, he cleaned these, too. Gil removed a small cab floor panel in order to gain access to a ferrule that was fouling a wash-out plug (that needed to come out!). 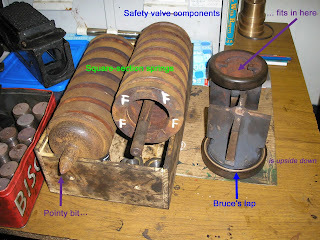 Bruce & Gil cleaned up the safety valve components, ferrules and gauge frame. 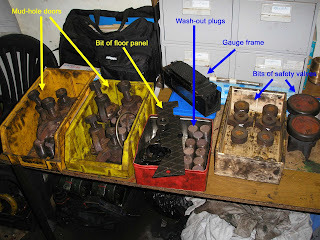 The plugs inside the smokebox were determined not to come out, so Ben, Cliff and Andy B [all Loco Dept] tackled these tough ones. Even then, two plugs are still refusing to come out! … one in the smokebox and one on top of the boiler, I believe. Let's hope the Boiler Inspector will let us off those two!!! After lunch, Bruce was commandeered to help with 4270 … and Gil got swept up by it too. They assisted in removing plugs and mud-hole doors, but couldn't remove them all because the boiler had not yet been drained. In fact, because the loco was in the shed and not near a drain, they had to manually bar the loco along to reach the drain! Bruce clambered up to remove 4270's safety valves, too. Their brass bonnet is held down using round-headed brass screws, and one of them …. … proved too tough for Bruce to undo on his own! Anyway, I think we are pretty much ready for the inspection on Monday, now. Family chores held me back today, so I only did the afternoon shift. I assembled 4 boot scrapers, sanded and stained 10 brushes and finished off applying primer/undercoat to the last two chairs in the production line. Loco Allocations. 2807 is scheduled for the November race trains with No 4270 as a backup. Nos 5542 and 7820 are scheduled for the Santa Specials.